When traveling with your family enjoy exclusive 50% discount on second room booked for same stay. This offer is combinable with Hyatt Member Rate and Advanced Purchase Member Rate. Family plan currently not available for bookings online. To book and for more information, please call +1 800 233 1234 or email reservations.grandbahamar@hyatt.com. Offer valid for reservations made in advance between 02/25/2019 and 05/25/2019 for stays from 03/01/2019 through 12/22/2019 at Grand Hyatt Baha Mar. Family Plan is only applicable to families that are traveling with children 18 years of age and younger. Must request offer code at time of booking to qualify for discount. A limited number of rooms are allocated to this offer; reservations subject to availability. Offer not valid with groups, conventions, other promotional offers, tour packages or special rate programs. Rate is per room, per night, based on double occupancy and excludes service charges, mandatory resort fees, applicable taxes and other incidental expenses. Additional charges may apply for additional guests or room type upgrades. Family Fun and Adventure awaits! Offer valid for credit per stay that can be applied against $175 F&B Credit, applicable to Hyatt Outlets Only. Offer valid for reservations made in advance between 04/02/2019 and 07/31/2019 for stays from 06/01/2019 through 11/30/2019 at Grand Hyatt Baha Mar. Must request offer code FUN175 at time of booking to qualify. Credits must coincide with guest’s stay at Grand Hyatt Baha Mar. No credits may be used towards alcoholic beverages. A limited number of rooms are allocated to this offer; reservations subject to availability. Offer not valid with groups, conventions, other promotional offers, tour packages or special rate programs. Rate is per room, per night, based on double occupancy and excludes service charges, mandatory resort fees, applicable taxes and other incidental expenses. Additional charges may apply for additional guests or room type upgrades. Guest is responsible for all charges not included in package. No refunds for any unused portion of package. No substitutions nor replacement services or products offered for package inclusions. A portion of the rate for this offer may reflect taxes, service charges, gratuities, and third-party charges for certain included items, and those costs are not eligible for World of Hyatt® points. Need a day on the greens? Royal Blue Golf Club at Baha Mar is an 18-hole par-72 Jack Nicklaus Signature Golf Course suitable for recreational or championship play. It was uniquely designed as two courses in one, with the front nine featuring glimpses of the turquoise Atlantic Ocean and the back nine showcasing dramatic limestone outcropping with views of Lake Cunningham. Book your reservation today and enjoy endless rounds on one of the most prestigious golf courses in The Bahamas. A true golf lover’s paradise! A 3-night minimum length of stay is required. Offer valid until December 18, 2019. Offer valid for reservations made 14 days in advance between 02/07/2019 and 12/20/2019 for stays from 02/07/2019 through 12/20/2019 at Grand Hyatt Baha Mar. Must request offer code at time of booking to qualify for package, which includes: Unlimited Golf and Cart per stay . Package inclusions are subject to availability and must coincide with guest’s stay Grand Hyatt Baha Mar. Package inclusions provided by third parties are subject to change and such third parties are solely responsible for the provision or performance of the package inclusions they provide. No credits may be used towards the purchase of alcoholic beverages. A limited number of rooms are allocated to this offer; reservations subject to availability. Offer not valid with groups, conventions, other promotional offers, tour packages or special rate programs. Rate is per room, per night, based on double occupancy and excludes service charges, mandatory resort fees, applicable taxes and other incidental expenses. Additional charges may apply for additional guests or room type upgrades. Guest is responsible for all charges not included in package. No refunds for any unused portion of package. No substitutions nor replacement services or products offered for package inclusions. A portion of the rate for this offer may reflect taxes, service charges, gratuities, and third-party charges for certain included items, and those costs are not eligible for World of Hyatt® points. Casual and experienced golfers looking for a relaxing vacation in paradise will enjoy hitting the links during the day at Royal Blue, an 18-hole par-72 Jack Nicklaus Signature Golf Course Golf and rejuvenating in luxury accommodations at night. Offer valid for reservations made in advance between 12/22/2018 and 12/18/19 for stays from 01/02/2019 through 12/18/19 at Grand Hyatt Baha Mar. Must request offer code UGOLF1 at time of booking to qualify for package, which includes: Unlimited golf during daylight hours per day Golf Cart & Caddie, upon request, per day. 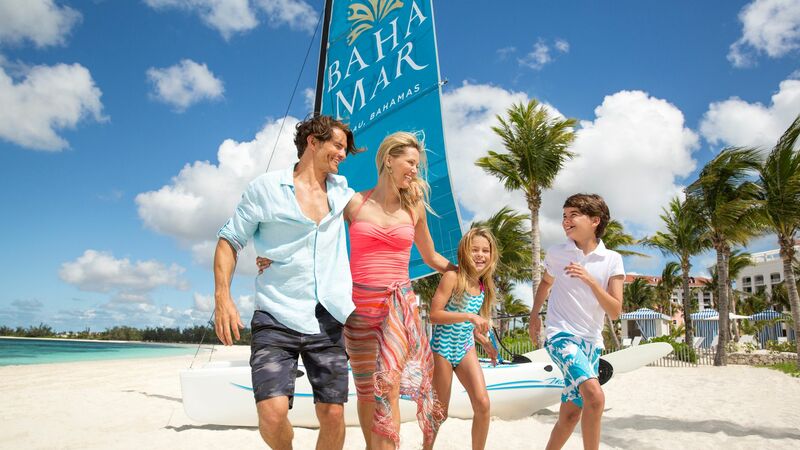 Package inclusions are subject to availability and must coincide with guest’s stay Grand Hyatt Baha Mar. Package inclusions provided by third parties are subject to change and such third parties are solely responsible for the provision or performance of the package inclusions they provide. No credits may be used towards the purchase of alcoholic beverages. A limited number of rooms are allocated to this offer; reservations subject to availability. Offer not valid with groups, conventions, other promotional offers, tour packages or special rate programs. Rate is per room, per night, based on double occupancy and excludes service charges, mandatory resort fees, applicable taxes and other incidental expenses. Additional charges may apply for additional guests or room type upgrades. Guest is responsible for all charges not included in package. No refunds for any unused portion of package. No substitutions nor replacement services or products offered for package inclusions. A portion of the rate for this offer may reflect taxes, service charges, gratuities, and third-party charges for certain included items, and those costs are not eligible for World of Hyatt™ points.